One of my favorite symbol is the Taiji Symbol. The symbol is make up of two fish, one with white body and black eyes and another with black body and white eyes. The white body fish or yang fish represents brightness, strength, life. The black body fish or yin fish represents darkness, weakness and death. The eyes of each fish has the opposite colours as their body. This shows that within a yang there is yin, within a yin fish is yang. The symbol shows that thing move in cycle over and over again. A lot of things can be related with this symobl, and one of it is life. The tail of the yang fish represents new life is borned. The head of the yang fish represents the strongest point of life. The tail of the yin fish represents weakness in life started to show out. The head of the yin fish represents death. The cycle continues when new life is borned. If you apply the symbol to show the strength or weakness of a country, you can see that a country cannot be strong or weak forever. You can look into history book, there is no country that can dominate the world forever. There are times when a country is strong, and after that it will become weak. For economy or stock market, the yang portion represents bull markets, and the yin portion represents bear markets. If you expose to stock markets, you will know that after a bull run, bear market will come eventually. After a bear run, bull markets will come eventually. Remember the eye of the fish are of opposite colours than the body. It means there will be a strong signal telling us that the cycle is about to change. 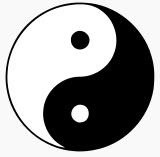 After the signal, the yang will become "yanger" intially and then slowly go toward the yin side. For the yin, it will become "yiner" intially and then slow go toward yang side.